Taking care of your mouth is important not just for shiny teeth but for your overall health. Gum disease has been linked to Alzheimer’s and heart disease. But that swig of mouthwash may not be helping. 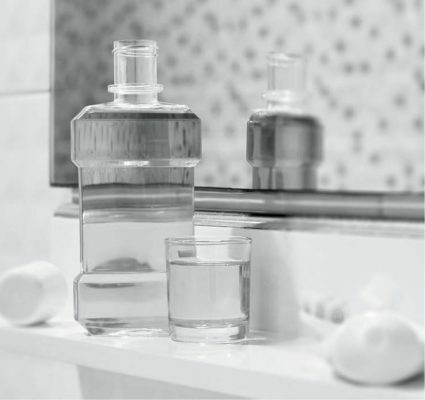 Researchers recently discovered that using mouthwash could actually increase your blood pressure. Why? Like our guts, our mouths contain a mix of good and bad bacteria, and having a balanced oral microbiome helps keep sickness at bay. But you can upset that balance by using mouthwash, according to a new study that was published in Frontiers in Cellular and Infection Microbiology. Good bacteria in the mouth allows for the conversion of dietary nitrate—commonly found in vegetables—into nitric oxide (NO). That molecule, in turn, helps maintain healthy blood pressure levels. Learn about the most efficient way to keep your mouth clean. “We know one cannot be well without an adequate amount of NO circulating throughout the body,” says lead study author Nathan Bryan, an adjunct assistant professor at the Baylor College of Medicine in Houston, Texas. “Yet, the very first thing over 200 million Americans do each day is use an antiseptic mouthwash, which destroys the ‘good bacteria’ that helps to create the NO. These once thought ‘good’ habits may be doing more harm than good.” Find out what other “healthy” habits that could be harming your mouth. Their findings might also explain why two out of three people with high blood pressure aren’t able to manage their hypertension with medication, Bryan says. The good news? The scientists found that the good bacteria returned to study subjects’ tongues after they stopped using mouthwash with chlorhexidine. Now, after cutting back on your mouthwash usage, you’ll want to find out 11 more things your dentist wishes you would do.